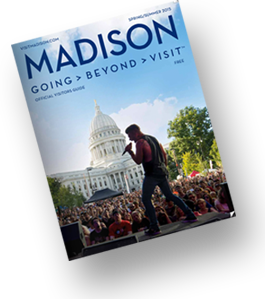 Indoors or out, Madison has winter opportunities that will knock your Smartwool® socks off! Plus, by saving on a room during Madison Hotel Week, you&apos;ll be able to treat the whole family to other adventures! Madison ranks as one of the best places for active living—even in the winter. The first stop for many in the cold months is Devil&apos;s Head Resort, which offers great skiing, lessons and rentals. If you&apos;d rather ice skate or go sledding, Madison&apos;s outdoor rinks include Tenny, Vilas, and Elver parks—all have rentals, concessions and a warming room. The Henry Vilas Zoo is also on our short list of "things to do with kids," especially since admission is free! Check out our Winter Wonderland itinerary for more on sledding, cross country skiing, snowmobiling and snowshoeing. Cave of the Mounds is a National Natural Landmark and home to an array of crystal formations—perfect for your little excavator or rock collector. The Madison Children&apos;s Museum is full of award-winning exhibits like an art studio and rooftop garden, and is located downtown near the Wisconsin State Capitol. Kids in the Rotunda at the Overture Center is also downtown, and features a different performing arts act every Saturday, such as magicians, dancers, puppets and other national performers. If you&apos;re looking for an experience like none other, visit House on the Rock, home to the world&apos;s largest indoor carousel, among other trinkets and collections. Keva Sports Center is a great place for your kids to try indoor soccer, basketball, volleyball, flag football, and badminton. Or if you&apos;re more of a mini-golfer, check out Vitense Golfland, home to indoor miniature golf, a year-round golf range, and platform tennis. Madison has new twists on classic childhood faves. Ella&apos;s Deli and Ice Cream Parlor provides great food and a miniature train that chugs around the restaurant. The Daisy Café and Cupcakery features deluxe cupcakes and kid favorites like grilled cheese (knowingly served with the crust cut off), and Dotty Dumpling&apos;s Dowry has been voted "best burger" for more than 30 years in a row. The Great Dane Brewing Co. has dino chicken nuggets and Ian&apos;s Pizza is famous for its macaroni and cheese pizza. Visit our Restaurants page for a complete listing of dining options. When it&apos;s dessert time, try a scoop of Blue Moon at The Chocolate Shoppe Ice Cream Company, a kid favorite that tastes like Fruit Loops. Or visit the Hubbard Avenue Diner and Bakery and Monty&apos;s Blue Plate Diner, home to milkshakes served up in a classic American diner atmosphere. The Market Street Diner serves re-invented childhood favorites—like French toast made with homemade cinnamon bread. Try our Sweet Treats page to see more scrumptious favorites.